We all know that Chair’s are confident, self-assured individuals with great intellect and management skills right. Perhaps, but they are but they also spend much of their time concerning themselves with the dynamics of their board – particularly when it comes to appointing a new Director. In a previous article, I looked at the four ways in which board appointments are made. This article outlined the most common ways people are appointed to a board. However, regardless of how you are appointed, the Chairperson is key to your board appointment. For many of you that will seem obvious but it is worth pausing to consider what this means for your potential appointment. Consider further what that means if they don’t know you and what ramifications that has on the application you submit and the research you need to do prior to applying for a role or even having an informal conversation with the key decision makers. Why is the Chairperson the key to all board appointments? Because, most obviously, they are the ultimate decision makers who sign off on any new appointment. Which is right and proper, after all, it is their reputation that is first on the line before anyone else’s should your appointment not work out. However, they don’t make this decision in a vacuum. A Chairperson has to appease many different stakeholders – internal and external, perhaps shareholders and clients or even the executive team – which means that they need comfort that you are not a risk to their board’s dynamics or the organisations future. Why would a Chairperson be so concerned about new appointments? I have written in the past about many people believing that boards are like rockpools. A rockpool – like one you might find on a headland or a beach – is a robust ecosystem thriving on the tide coming in and out twice a day, delivering any number of new entities into its presence. A board, many think, operate the same way – as a new member joins, it adapts accordingly and it becomes stronger for it. However, the reality is often very different. In my experience, Chairs are very wary of any kind of change to their board’s composition. As such, they will likely consider their board to be more akin to a Northern Quoll than a rockpool. Consider the introduction of the Cane Toad to Australia in 1935 to control the native grey-backed cane beetle. Despite the best intentions, the introduction of this single entity is having a devastating effect on Australia’s native ecosystem and the Northern Quoll (that eats cane toads and die as a result) in particular. What difference does it make if a Chair thinks their board is like a Northern Quoll? In short – it should make every difference. Understanding that the Chairperson is key to your appointment means that you should target everything you do and say towards that individual. That means targeting them to ensure that they do not perceive your potential appointment as a risk that will harm their reputation and therefore their career. Providing the Chairperson with a level of comfort? Understanding that any new appointment (potentially yours) will change the dynamics of a board is important to grasp. Once you have, you will naturally understand that the Chairperson needs a level of comfort before appointing anyone new to the board. This is why appointments via a personal connection are so common and being known is invaluable. It also means that submitting an application without doing any research, not knowing any of the major players, not being a ‘known quantity’, not speaking to the organisation before applying, or just writing a quick application will drastically reduce your chance of getting an interview let alone being appointed. Keep an eye out for future articles on these subjects where we spell out for you exactly what you need to do to get appointed. Of all the steps you can take to ensure your successful journey to a board career, joining Board Direction is the best decision you can make. 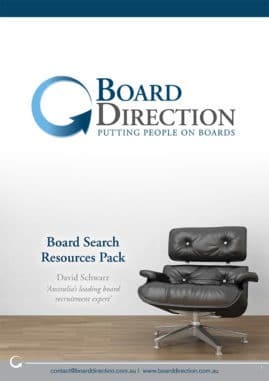 Becoming a member of Board Direction allows you full access to the most comprehensive list of board vacancies, entry into our NED Directory to make it easy for boards to find you and depending on the membership package you choose, you will receive a bespoke Board CV, an effective LinkedIn profile, entry to our Board Search Masterclasses, the Board Appointments book, Board Application Reviews and much more.